The Collie Dog Breed and the name Lassie became almost synonymous at one point in history, where children simply called it "the Lassie dog." 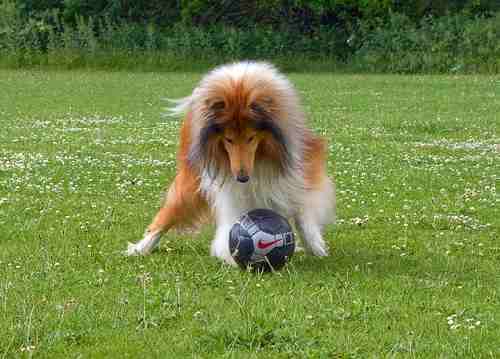 This fictional TV hero is the best known Rough Collie of all times. 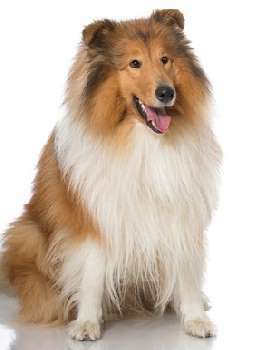 We think of the this breed as a loving, loyal family dog that is courageous, full of energy, and very smart because that is what Lassie symbolized. 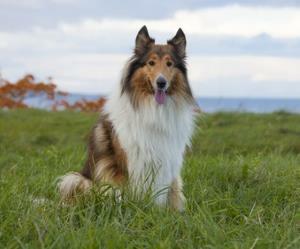 “Lassie looked brilliant, in part because the farm family she lived with was made up of idiots. Remember? One of them was always getting pinned under the tractor, and Lassie was always rushing back to the farmhouse to alert the other ones. She'd whimper and tug at their sleeves, and they'd always waste precious minutes saying things: "Do you think something's wrong? Do you think she wants us to follow her? What is it, girl?" as if this had never happened before, instead of every week. Film Ideas for the 'Lassie' Lover! These dogs come in two varieties: Rough and Smooth. Both are identical in all aspects except for the coat. The Rough is the better-known variety and sports a long harsh-textured coat. Their coat is thick and long everywhere on their body except the head and legs. The Smooth Coated variety has a short, dense, flat coat. 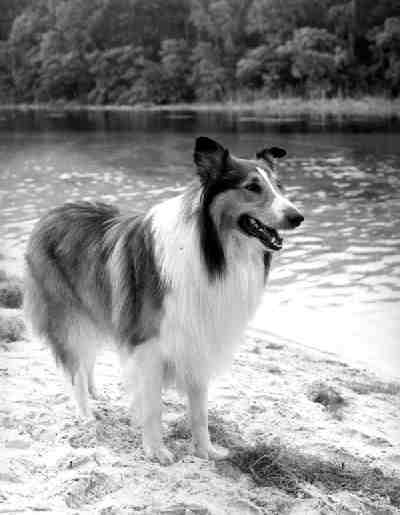 This breed became popular as early as the 1920s when the Lassie books by Albert Payson Terhune were published, but with popularity, comes over-breeding and harmful traits develop. These dogs should be calm, quiet and alert. They do bark because of their herding background. 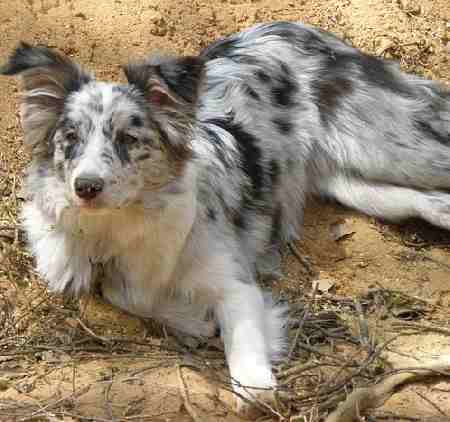 Some collies today are noisy, difficult to train, and high-strung. Like any purebred dog, there are variations in temperament, but purchasing one from a reputable breeder is one way to assure you are getting a well-balanced dog. These dogs are self-assured and reliable, gentle and affectionate. They are playful and protective of their own family, though they are likely to be more reserved with strangers. They may not be able to work a flock of sheep, they still maintain some of their natural herding tendencies. All of these characteristics make them a good breed for children. They are generally good with the kids but don’t assume they will be safe around very young children. The safest way to know that your collie will love and protect your children is to raise them together from a very young age. Puppies should begin their socialization process the day they arrive in their forever home. What made this dog breed so successful as a farm dog in the hills of Scotland centuries ago also make them well loved as pets. They can live in most latitudes and can tolerate most weather conditions. Hot weather is hard, but many owners will shave them down in the hottest of months. Winters are comfortable because their thick coat insulates them against cold and wet conditions. Herding dogs must meet two standards to be successful: They must be able to guard and guide yet be gentle and fearless. These traits have served well for all those former herding dogs as they transition to being pets. Collies enjoy a variety of activities sanctioned by the American Kennel Club. Some dogs still maintain their ability to herd, and there are herding tests and trials that these dogs can participate in and do well. They also do well in agility, flyball, and tracking. Therapy work is another area that these dogs excel in, because of their gentle nature. Some dogs, mostly the smooth-coated varieties, have been used as war dogs, and in search and rescue work. The exact origin of the breed has been lost in history, but everyone can agree that both varieties have existed for a very long time in Scotland and northern England and Wales as herding dogs, possibly from the same stock as the Border Collie. Even the name “Collie” can’t be traced. One theory suggests that the name was derived from a Gaelic word meaning useful. The herding dogs of Scotland were large, healthy, and had the stamina to survive the harsh upland conditions of the hilly terrain. Herders in Wales were smaller than their cousins in Scotland. It is thought that the Russian Borzoi was introduced into the breed that resulted in a dog that had a thinner, longer head. 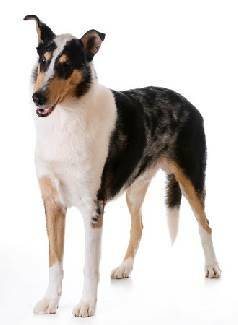 This head shape is still wanted for Rough Coated Collies and even today, breeders will selectively breed to improve or exaggerate this shape. This breed became more popular as pets during the reign of Queen Victoria. She saw one at Balmoral Castle in Scotland and took one as a pet. Herding dogs were still needed, but the Border became the preferred choice as a working dog and the Rough transited towards being a pet. This breed finally made its way to the US and was officially identified by the AKC in 1885. In 2016, the breed is ranked at number 37 in popularity in the United States. These dogs are highly intelligent, a characteristic that made them successful as a herder in Scotland years ago. With that intelligence, a need for an independent personality is a must if they are required to make split-second decisions that will protect their flocks. Intelligence means that they are easy to train. But, if you combine high intelligence with independent thinking, you may find that training this dog may be more work than you first imagined. Constant repetitions that are often required for dog training will quickly bore a collie. They also think for themselves, and they must be assured that what the trainer wants is important. Resistance to training is not unusual especially if the dog does not respect or understand the trainer. They love the variety and new challenges and anything that falls short will be met with resistance. Training can be successful if there is a stream of new challenges, new training techniques and training sessions that are novel and innovative. This poses a significant problem for a novice dog trainer. Collies much prefer to play rather than serve guard duty. They do not always fare well well when it comes to attack training because they are not likely to bite or attack prey or other humans for that matter. This is good for those who want a watchdog without the guard dog instincts. But luckily, this breed can be masters when it comes to watchdog duty, and what assailant would challenge this dog when he was protecting his herd or children. Every breed comes with it’s share of jobs, whether the breed requires more work regarding training, more work to assuage the high energy level or more time required for grooming. With the rough coated variety, grooming tasks may take priority over other areas of care, but not so with the smooth coated collie. A thorough brushing at least three times a week is necessary if you don’t want your home, furniture or floor to be besieged with shed hair. For this breed we highly recommend the FURminator grooming tool. If brushing is not your thing and you are still drawn to the breed, consider the smooth coated variety that requires much less time to be groomed. Even though the smooth collie requires less care, they still shed. They are a clean breed that does not have a noticeable doggie odor, so bathing can be put off unless the dog gets very dirty. Like all breeds, their nails will need to be trimmed and teeth brushed. The hair coat should be checked periodically for fleas and ears checked for any debris or possible infection. 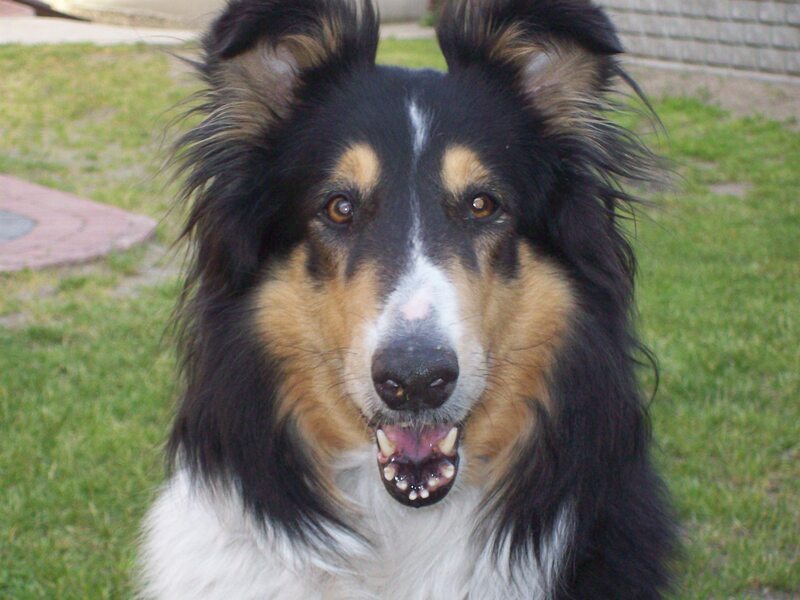 Collies are generally healthy, but they are susceptible to some health problems just like all other dogs. Large dogs, in particular, are susceptible to bloat. 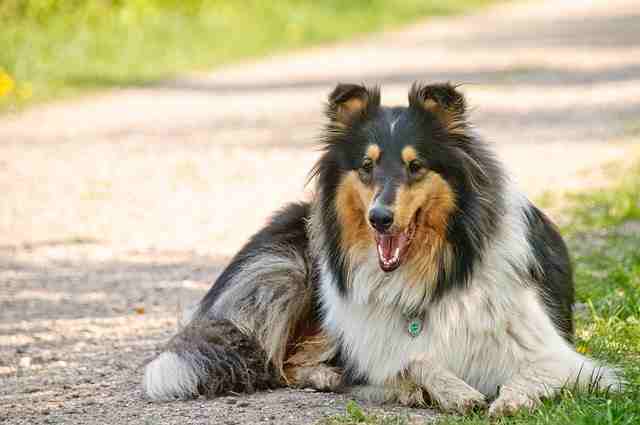 Hip and elbow dysplasia also affect large breed dogs, but collies are no more prone to these disorders than any others. Luckily, parents of breeding stock can be tested for both hip and elbow problems, and prospective buyers should always ask to see test results. Collies are also prone to eye problems, loosely grouped together as “Collie Eye,” which cause vision loss and even blindness. Any reputable breeder will always test all breeding stock and not use any dogs that have failed their eye tests. Most will also have the litter of puppies checked out by a veterinary ophthalmologists before placing them in homes. If the puppy of your choice has a problem, it is important to discuss the issues with the veterinarian. Some eye problems do not show up until later in life, so even if the puppy’s test is clear, it does not mean that the puppy is free and clear for life. This nose problem is a rash that does peel when exposed to sunlight. Skin infections include dermatomyositis, an inherited skin disease that involves not only the skin but also the muscles and blood vessels. If you decide on a this breed, consult your veterinarian about the appropriate type of Heartworm preventative that would be safe for your dog. Lastly, as most people know, large breed dogs do not enjoy the long lifespan as many small breed dogs. Most of these dogs live about 10 to 12 years, though some live much longer. Excess weight can put a strain on joints and reduces the quality of life. The guides below are excellent reads! Click on the images for further information.